X. 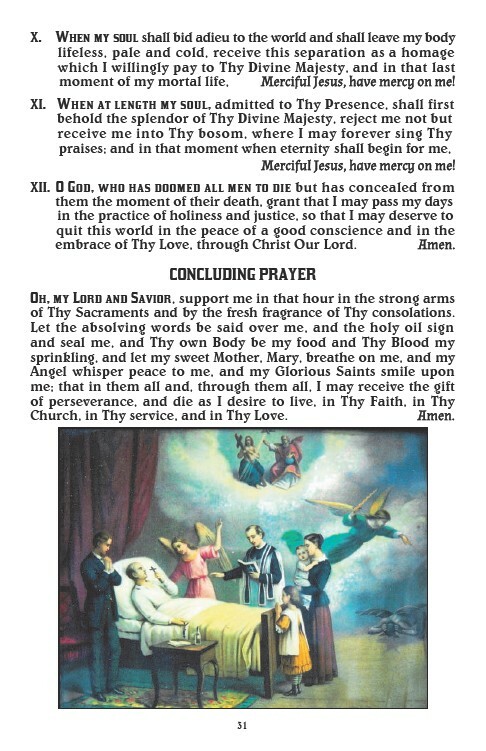 When my soul shall bid adieu to the world and shall leave my body lifeless, pale and cold, receive this separation as a homage which I willingly pay to Thy Divine Majesty, and in that last moment of my mortal life, Merciful Jesus, have mercy on me! XI. When at length my soul, admitted to Thy Presence, shall first behold the splendor of Thy Divine Majesty, reject me not but receive me into Thy bosom, where I may forever sing Thy praises; and in that moment when eternity shall begin for me, 31 Merciful Jesus, have mercy on me! XII. O God, who has doomed all men to die but has concealed from them the moment of their death, grant that I may pass my days in the practice of holiness and justice, so that I may deserve to quit this world in the peace of a good conscience and in the embrace of Thy Love, through Christ Our Lord. Amen. CONCLUDING PRAYER Oh, my Lord and Savior, support me in that hour in the strong arms of Thy Sacraments and by the fresh fragrance of Thy consolations. Let the absolving words be said over me, and the holy oil sign and seal me, and Thy own Body be my food and Thy Blood my sprinkling, and let my sweet Mother, Mary, breathe on me, and my Angel whisper peace to me, and my Glorious Saints smile upon me; that in them all and, through them all, I may receive the gift of perseverance, and die as I desire to live, in Thy Faith, in Thy Church, in Thy service, and in Thy Love. Amen.